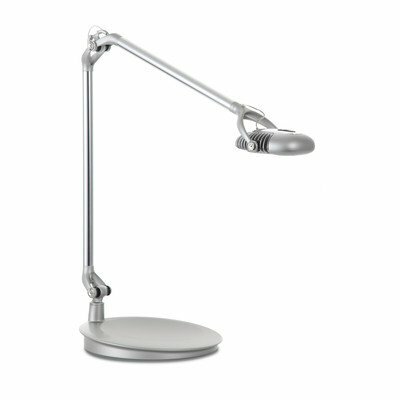 EDE+AS Mount: Access Rail, Finish: Silver Features: -Table lamp.-World's first task light series to employ groundbreaking MCX LED technology.-First solid-state task light to meet Energy Star requirements.-Unique replaceable head allows for easy in-house repair.-Perfect internal counterbalance provides fingertip adjustability.-Made of up to 81% recycled and 99% recyclable content.-Heat-dispersing design provides unique, modern aesthetic.-Designed to easily fit under overhead bins and on virtually any desktop work space.-135 Front-to-back head tilt.-90 Side-to-side head rotation.-Maximum reach: 28''. Specifications: -360 Swivel from base. Dimensions: -Overall dimensions: 29.5'' H x 14.5'' W x 14.25'' D, 6 lbs.